Four generations of Macleans have been Scottish Master Bakers. Today, in the picturesque Moray town of Forres, adjacent to both the Highlands and to Speyside and within walking distance of Sueno's stone (a carved stone over 1000 years old commemorating an ancient battle between Picts and Scots ), the Maclean family manage three elements in their Bakery business - their traditional Craft Bakery, their retail shops and wholesale customers as well as their Biscuit production. The Macleans use local and natural ingredients, some well kept secrets fom the family recipe book, the inspiration of Macbeth and the skills of a family steeped in the traditions of Scottish Baking to produce the range of products that their customers enjoy - time after time. 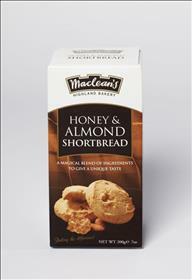 Seagreens is added to Macleans Highland Bakery's products for flavour. These products can be bought online or at supermarkets.